The ultimate online experience: faster games, smoother videos, and more control than ever before. That's how Rivet Networks has chosen to market its latest Gigabit Ethernet Controller, the Killer E2500. 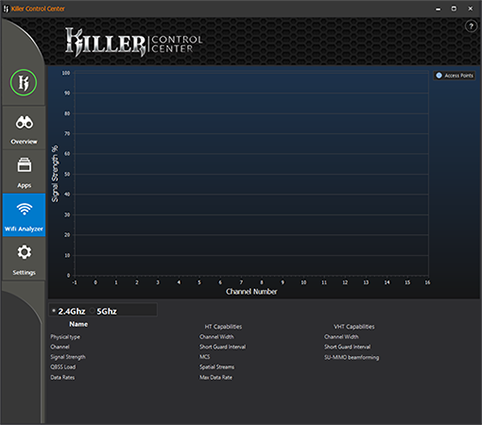 Introduced as a successor to the well-received E2400, the new addition to the Killer range uses a familiar combination of hardware and software to identify and prioritise network data, resulting in a smoother overall web experience. Going by what's on the tin, it's a product that makes sense for just about anyone who plays online games, streams multimedia content or uses the Internet for any number of bandwidth-intensive tasks. 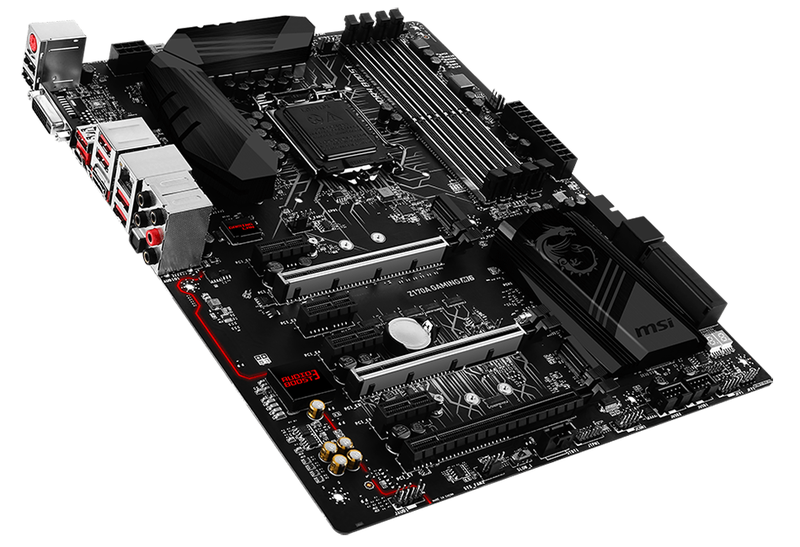 To put the new chip through its paces, we've been sent an MSI Z170A Gaming M6 for evaluation. Heading to stores in the next few weeks at a yet-to-be-confirmed price, MSI's feature-packed Z170 motherboard is a stylish choice with reinforced PCIe slots, support for SLI and CrossFire, Nahimic-powered audio, USB 3.1 Type-C, and the popular Click BIOS 5. It also happens to be one of the first to feature the Killer E2500 controller, with Gigabyte and other vendors expected to follow before year's end. Winning over OEMs doesn't appear to be a problem, however Rivet Networks does seem to have its work cut out in convincing consumers. Driver problems on much older hardware still linger in the minds of enthusiasts, and if changing perception isn't a big enough challenge, there's arguably an even larger hurdle: rival network interface controllers (NICs) from the likes of Intel and Realtek tend to work just fine, so why should anyone consider a change? Hardware optimised for maximum throughput and minimum latency is part of the Killer appeal, yet while the E2500 is said to have been improved with better packet handling, the biggest changes take place in software. 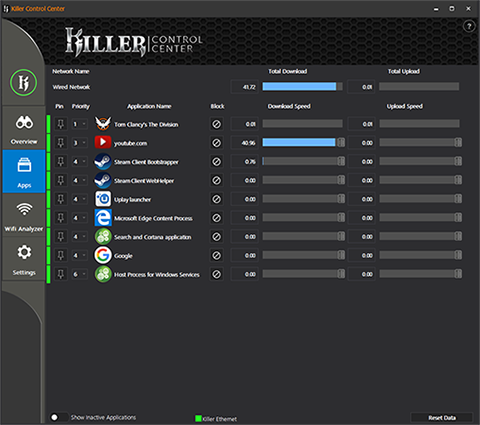 A new Killer Control Center promises full control of your system's network performance, while the NIC's ability to detect and prioritise certain types of traffic continues to play a crucial role. The magic trick is Killer's ability to detect, identify and prioritise latency-sensitive data and other critical network traffic. 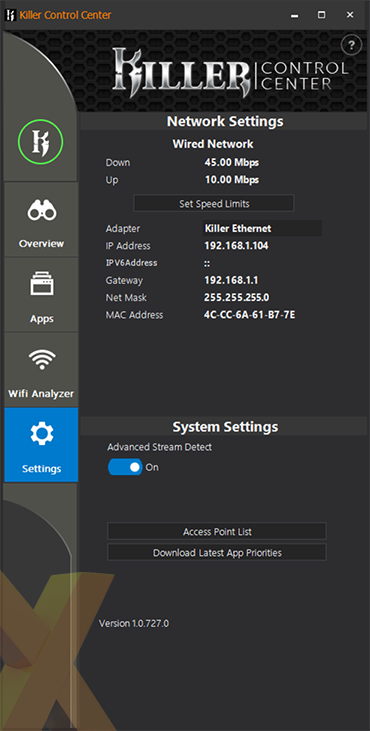 Marketed as Advanced Stream Detect, the software picks out any programs utilising the network and automatically assigns a priority rating of 1-6 in order of importance. 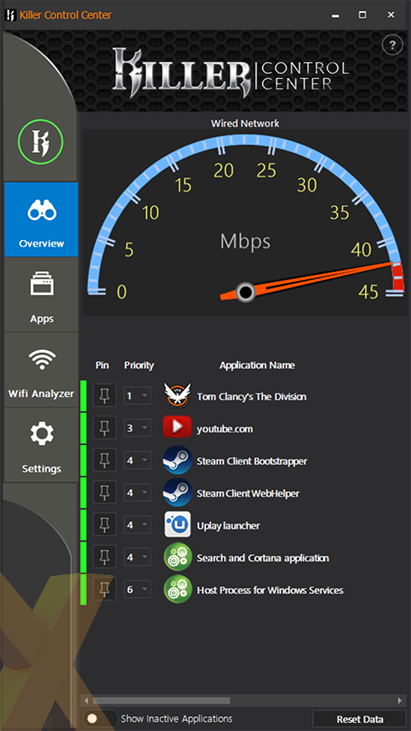 A modernised 'overview' page now highlights identified apps, with a speed gauge showing how much bandwidth is currently being used. By default, games are typically identified and tagged as priority 1 or 2, audio and video slots in at or around level 3, most general traffic sits at 4 or 5, while large time-insensitive transfers (think torrents or Windows updates) fetch a lowly 6. App priorities are by default governed by a regularly updated master list, and there are meaningful improvements being introduced with the new software. One such example is Advanced Stream Detect's newfound ability to detect over 500 of the top global websites. Priority is automatically handed to browser tabs that need it, and the software can now detect websites on all tabs, irrespective or which browser is used. 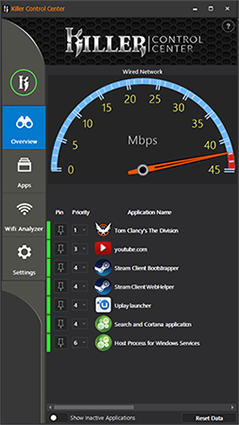 Sliders and toggle switches on the Apps page make it easy for power users to limit bandwidth or block network access entirely, and frequently used programs can be pinned to the top for quick access. Enthusiasts may spend a short while tinkering with the available options, but if you're of the opinion a NIC ought to just work, the E2500 will happily do its thing without any user intervention. Going by the assumption that too much information can be off putting, Rivet Networks has streamlined the software to ensure there are fewer tabs, less options and no complicated check boxes to consider. 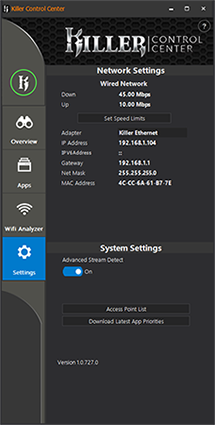 Advanced Stream Detect is enabled by default, and the only recommended tweak is found in the settings tab, where a user can define his/her broadband speed in order to assist the software in managing bandwidth. If you're unsure of how fast your line actually is, a built-in speed test can be used to populate said fields. 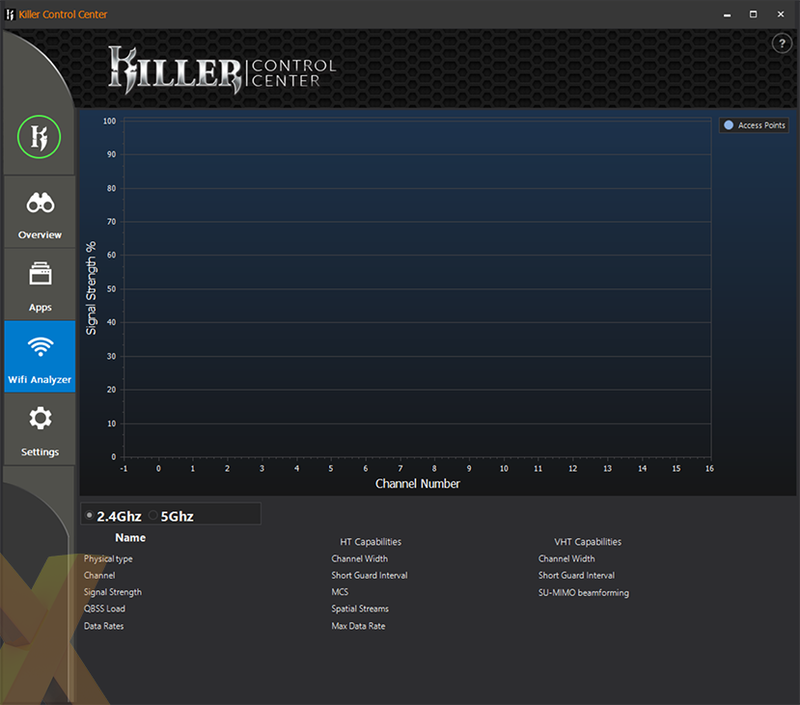 Though not applicable to this review, the Control Centre also presents a WiFi Analyzer that's handy for keeping tabs on channel congestion on either the 2.4GHz or 5GHz bands. 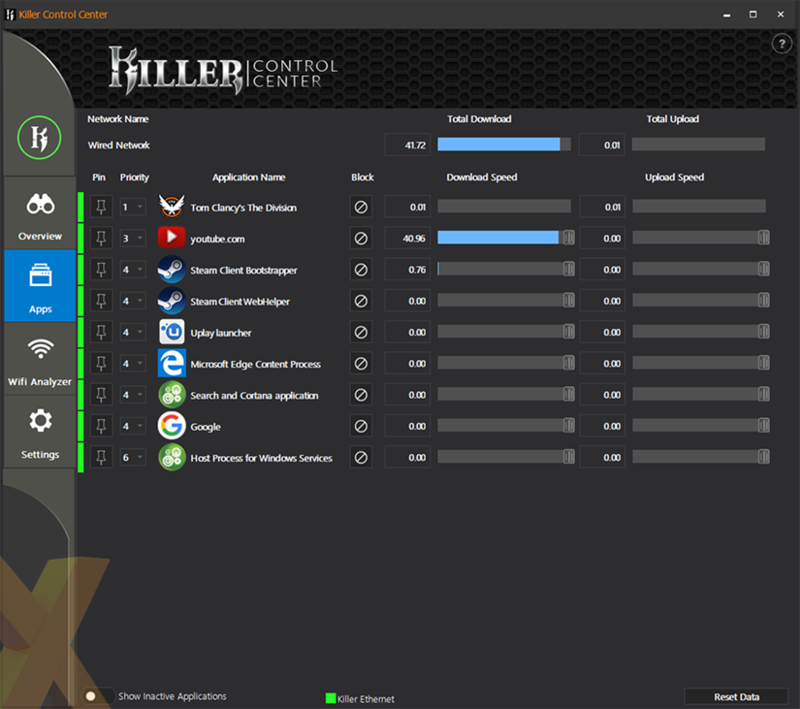 Should your hardware happen to feature both a Killer NIC and Killer WiFi, you'll be granted access to DoubleShot Pro, through which both connections are utilised and latency-sensitive traffic is automatically routed to the most reliable link. We're of the opinion it makes implicit sense for certain types of network traffic to be given priority. There's no reason for a video call to run at a lower resolution because of a torrent that's downloading in the background, and an online game shouldn't stutter because a large Windows Update has started to come down the pipe. In our experience, a Killer NIC can minimise such risks, so let's put the E2500 into perspective with some real-world benchmarks.